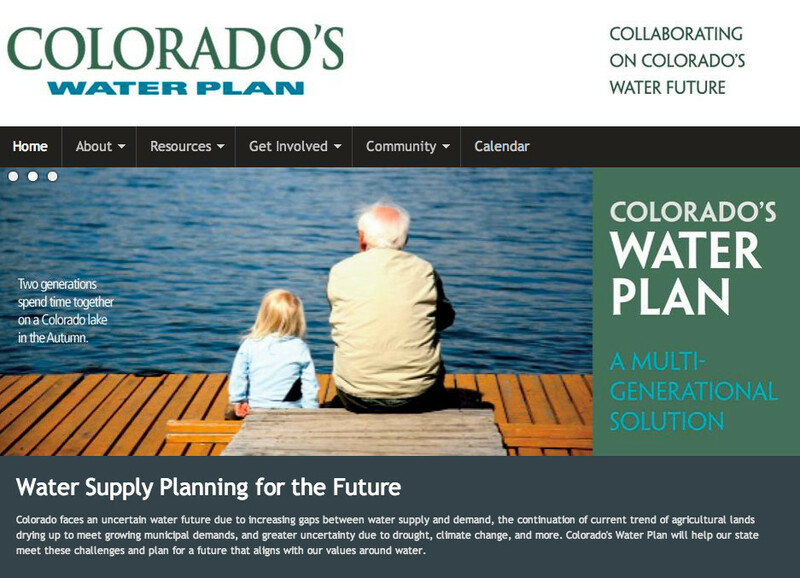 …despite an extensive education and outreach campaign, just how involved is the general public in planning Colorado’s water future? Kate McIntire, the women in charge of public engagement and outreach for the Colorado Water Conservation Board, said they’ve mostly relied on volunteers in a process that goes back 10 years when the Public Education, Participation and Outreach group was established. Later, McIntire said, they engaged the nine basin roundtables to help. The Water Board received more than 15,000 comments directly and through the nine basin roundtables when creating the draft plan. That’s not enough for state Senator Ellen Roberts, a Republican from Durango. She still thinks there’s a lack of awareness amongst the general public. In 2014 the senator co-sponsored a successful bill that called for more involvement by the legislature in water planning. 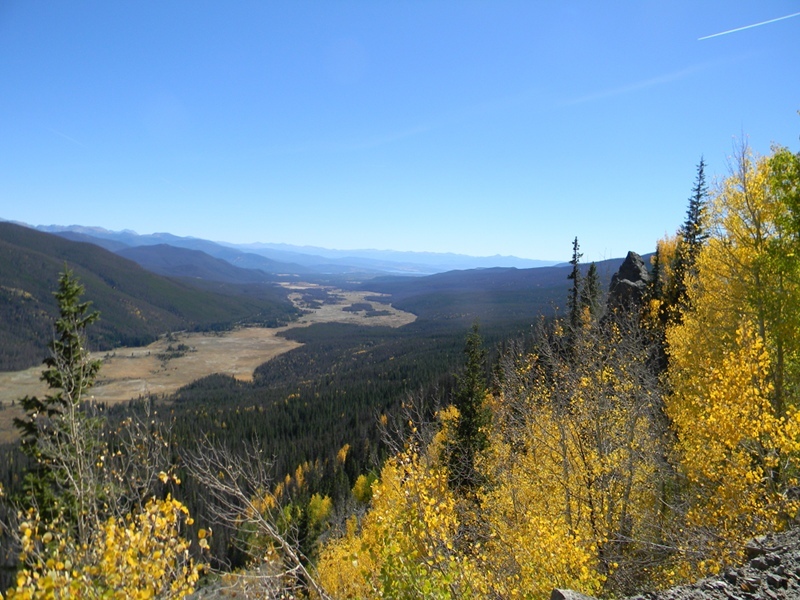 That led to a series of public meetings in all the major river basins of Colorado. Theresa Connelly, a water advocate with Conservation Colorado, is heartened by what she sees as a growing awareness in water issues in the state, even if there’s a lack of awareness about an actual water plan. “Folks may not know as much that there’s an actual state water plan going on, but folks are very aware of water issues that we’re facing,” she said. But Connolly, like Senator Roberts, said the public outreach effort needs to be more inclusive. She cites the fact that many of the meetings were in the middle of the workday, which made it difficult for some to attend. People may not have time to attend a meeting, but maybe they’ve sent an email or a postcard, and those voices should also be heard. “I think sometimes those small actions are disregarded as a form letter or something that isn’t truly meaningful and I think that that’s absolutely not true,” Connelly said. The Colorado Water Conservation Board has received over 2000 comments in the first few months since the draft was submitted and adds all input received through May 1 will be considered in the second draft, said the board’s McIntire. She points out that the CWCB is responding to all comments received and those responses are available for public review. According to Don Hartley, a member of [Communities Protecting the Green], an organization known as the Colorado Wyoming Coalition is finishing a feasibility study involving the transfer of water from the Flaming Gorge. The coalition was originally known as the Parker Group, after the community in Colorado initially proposing the project, before it rebranded itself. According to a 2011 document titled “Flaming Gorge Investigation Status Report,” the municipal governments in Cheyenne and Torrington, along with the Laramie County government, are involved the coalition’s study to move water from the gorge to eastern Wyoming and northern Colorado. The document states more than half a million people living in both states would be served by the project. “It’s kind of slow right now, but things could get interesting once that study is completed,” Hartley said. Hartley believes the study could be completed within a matter of weeks and said they need to be vigilant with the group because they pose the biggest threat to the river. Hartley said the second issue on the horizon involves a state water plan under construction within the Colorado state government. One of the key issues Hartley and others at Communities Protecting the Green are watching involves the augmentation of the river to provide water to communities in Colorado. More Flaming Gorge Pipeline coverage here and here. That means agricultural needs, projects to bring water into the state, environmental protection and quality of life issues will be given equal weight with the elephant in the room: municipal water supply. King, along with Alan Hamel, chairman of the Colorado Water Conservation Board, and CWCB Director James Eklund met with The Pueblo Chieftain editorial board Thursday to discuss the upcoming water plan. Gov. John Hickenlooper has ordered the CWCB and other state agencies to develop the plan by late 2014. It would be Colorado’s first comprehensive blueprint developed by the people in the state. Eklund said it would build on the basin roundtable and Interbasin Compact Committee process started in 2005 to get grass-roots consensus about what is needed. The CWCB will take a more active role in developing water leasing pilot projects under HB1248, which was passed this year, Eklund added. There is a sense of urgency. “If we can’t do this now, we might as well quit talking about it and let water Darwinism take its course,” King said. Colorado still needs to look at projects to bring in new water supplies despite a state water board’s decision last month to put the Flaming Gorge pipeline task force on ice. The Arkansas Basin Roundtable, the main proponent of the task force, still supports dialogue with other state roundtables on the subject and getting the statewide Interbasin Compact Committee to tackle the issue head­-on. “It’s time we start looking at issues,” said Jeris Danielson, who represents the roundtable on the IBCC. The IBCC has adopted a “four­legged stool” that includes new supply along with identified projects, conservation and agricultural transfers. The Colorado Water Conservation Board in January voted to suspend funding for the task force, saying the committee was duplicating work assigned to the IBCC. 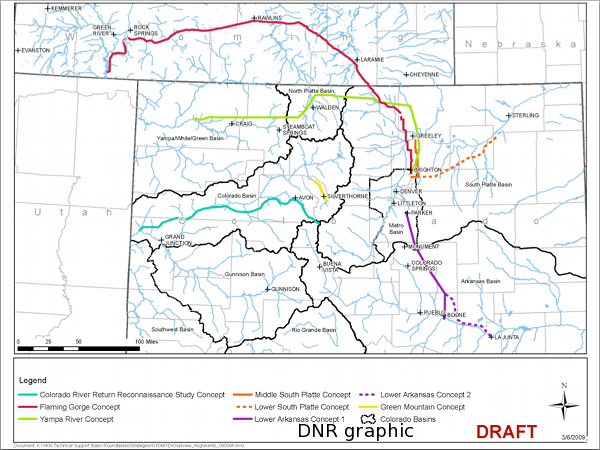 The group began its work in 2011 to determine issues surrounding two proposals to build water pipelines from southwestern Wyoming to Colorado’s Front Range. “I think the most important thing we did was establish a list of attributes for what constitutes a good project,” said Betty Konarski, a member of the task force. Roundtable Chairman Gary Barber, who also sat on the task force, said the group identified an immediate gap in agricultural water needs, and a municipal gap by 2020. It made no recommendation on whether or not to build a Flaming Gorge pipeline. Danielson and Jay Winner, the other basin representative on the IBCC, vowed to press the IBCC to more action at its meeting in March. More Flaming Gorge Task Force coverage here. Here’s an article from last week that deals with the demise of the Flaming Gorge Task Force. It ran in the Grand Junction Daily Sentinel and was written by Gary Harmon. The Green River is a paddler’s paradise. In May 2012, Steve Markle with O.A.R.S. told us why paddlers love the Green River so much. Then in August, Matt Rice, our Director of Colorado Conservation, told us about his trip fishing the Green, and the big trout, beautiful scenery, and solitude he found there. Finally, Scott Willoughby with the Denver Post gives a description of the river that makes you jealous if you don’t have easy access to this trout oasis (even if you aren’t an avid fisherman!). It is no wonder so many people care about preserving adequate water flows in the Green River. It not only provides essential water and cash flow for West Slope towns, but also a great adventure for the citizens of Colorado and beyond. A decision by the Colorado Water Conservation Board not to fund the second phase of a Flaming Gorge pipeline task force does not affect either project that wants to bring water into the state. The CWCB Tuesday turned down a $100,000 extension of the committee, saying its efforts duplicate the role of the Interbasin Compact Committee. Alan Hamel, of the Arkansas River basin, was the only member of the CWCB who voted in favor of continuing to fund the task force. The task force was formed to identify questions that would face any statewide water project, and from the start said it would not endorse or eliminate either of two proposals to build a Flaming Gorge pipeline. “This decision sends a clear message that the IBCC needs to step up and do something about new water supply,” said Jay Winner, one of the Arkansas Basin Roundtable’s IBCC representatives. Environmental groups this week tried to depict the decision as a defeat for Aaron Million’s proposal to build a 500­ mile pipeline from the Green River to Colorado’s Front Range. However, Million claimed last week that the neutral decision by the task force was a win for him. He is working on engineering needed to resume federal consideration of the project. The Colorado-­Wyoming Coalition also is pursuing its version of a Flaming Gorge pipeline, but is still waiting on Bureau of Reclamation studies to determine if it will move forward, said Eric Hecox of the South Metro Water Supply District. The task force was formed to study issues surrounding the project, not to decide whether the project should move forward. After completing a report on the pipeline, the task force requested $100,000 to study “new supply projects in general” at Tuesday’s water board meeting, Gimbel said. Aaron Million, principal of Wyco Power and Water Inc., called environmentalists’ characterization of the decision “grossly inaccurate.” The company has proposed building the pipeline to bring water from Wyoming to the Front Range, including Fort Collins. “One of the reasons I think the environmental community’s been so vocal is that this project has a lot of merit to it,” said Million, who contends the project would add to Poudre River volume. Charlie Card, northeastern Utah coordinator for Trout Unlimited, says the news from Colorado is good, but he has heard similar news before and knows not to let his guard down when it comes to water in the West. Numerous recreational and financial impacts from proposed pipelines pumping water out of Flaming Gorge Reservoir, which sits on the Utah/Wyoming border, or the Green River above it have been revealed by Trout Unlimited and other concerned groups. • Wide fluctuations of water levels at Flaming Gorge would create ideal conditions for noxious weeds along the shore, affecting waterfowl, mule deer, pronghorn, bighorn sheep, sage grouse and other species. Open shorelines may become inaccessible for recreation. • Diminished flows on the Green River below the dam will affect species of concern like the northern river otter, bald eagle, peregrine falcon, osprey, Lewis’ woodpecker, southern willow flycatcher and yellow-billed cuckoo. • A reduction of flows into the reservoir will inhibit recommended flow levels out of the dam. The recommendations were agreed upon by multiple agencies to benefit endangered fish (razorback sucker, Colorado pikeminnow, humpback chub and bonytail) in the Green River. • The main sport fish of Flaming Gorge — kokanee salmon, lake trout and smallmouth bass — are already facing a number of challenges in a delicately balanced ecosystem that has been rocked by the recent appearance of illegally introduced burbot. Lower and fluctuating water levels will only add to the challenges. • Access to the lake via existing boat ramps would likely not be possible if water as proposed in the Million project were removed from the reservoir. That impacts all businesses that rely on the reservoir including those on the shores of Flaming Gorge and including other towns and cities like Dutch John, Manila, Green River, Wyo., and Rock Springs. Similar facts are presented on the ourdamwater.org/ website of Sportsmen for the Green. The state’s most powerful water organization will spend no more money to study ways of piping water from the Western Slope to the Front Range, a move heralded by environmental organizations but one that might not squelch the idea. The Colorado Water Conservation Board turned away a request that it continue to fund a study of how to pursue large water projects, such as a proposed pipeline to the Front Range from Flaming Gorge Reservoir in Wyoming. The board’s decision was greeted as a victory by Protect the Flows, an organization of recreation, agricultural and other interests that depend on the Colorado River. “This decision tells Coloradans that (Gov. John Hickenlooper) and the water board know how much we value our superb recreation opportunities and the huge economy in Colorado generated by outdoor enthusiasts and tourism,” Protect the Flows spokeswoman Molly Mugglestone said. Water board members noted that such projects would be more appropriately studied by the Interbasin Compact Committee, a 27-member committee established to address statewide water issues. The proposed Flaming Gorge pipeline has been rejected on several levels and by federal agencies. It was criticized by government agencies, including Mesa County and Grand Junction, which cited unanswered questions about the effects of the project. The water board’s decision amounted to an endorsement of the need for conservation over development, Protect the Flows said. The Colorado Water Conservation Board (CWCB) today voted overwhelmingly to end funding for the ‘Flaming Gorge Task Force,’ which had been considering future large-scale water diversion projects such as the ‘Flaming Gorge Pipeline.’ The decision is in line with public opinion; a recent Colorado water poll found that four-in-five Colorado voters favor focusing on water conservation efforts rather than water diversions. 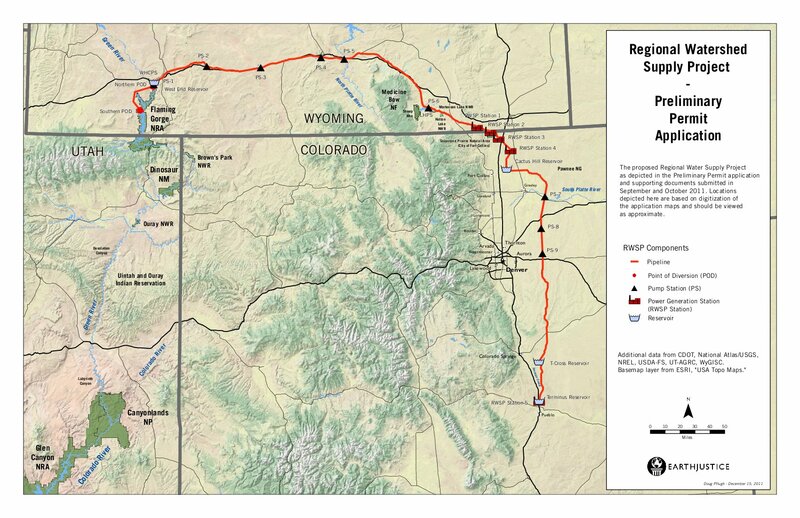 The ‘Flaming Gorge Pipeline’ (FGP) is a proposal to pump 81 million gallons of water a year across more than five hundred (500) miles from the Green River in Wyoming to the Front Range of Colorado—all at a projected cost of $9 billion dollars (according to CWCB calculations). Western Resource Advocates has consistently opposed the idea as unreasonable and unnecessary. We applaud Governor Hickenlooper and the Colorado Water Conservation Board for their decision to turn down spending additional money to examine new water diversions as a solution to meet Colorado’s water challenges, said Protect Our Flows director Molly Mugglestone. “It’s the right decision for what Coloradans want as reflected overwhelmingly in a recent bipartisan poll commissioned by Protect the Flows. The poll showed that more than 80 percent of Colorado voters would tell state officials to spend their time and resources focusing on conservation efforts, rather than water diversions; a majority of voters across political and geographic lines oppose building additional pipelines; and almost all express strong regard for Colorado rivers and a desire to protect them. [Aaron Million] has said the pipeline could actually help protect flows in over-used sections of the Colorado, especially in years like this, with abundant moisture in Wyoming, but well below average snowpack in Colorado.